The Googly Eyed Wild Thing series of lures are based on a 12mm bead head with four legs of various colours. They are about 90mm (3.5 ins) long and are designed to be trolled behind a flasher. They come in a variety of colours and have been colour matched to various flashers in combination packs. 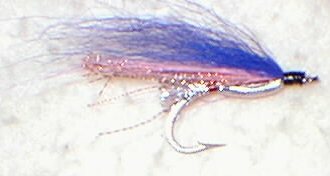 The Zipper Fly line of lures are tied on a special 5/0 stainless long shank O;shaugnessy Hook. They are 100mm (4 ins) long and come in 6 patterns (see catalogue) and can be used behind a L'il shooter flasher or a dodger to fish 5- 35 feet or a spinner to fish the surface. These lures can be used with O'ki Micro flasher for freshwater fishing. The Spastic Needle Fish line of lures are tied on a special 3/0 stainless long shank O;shaugnessy Hook. 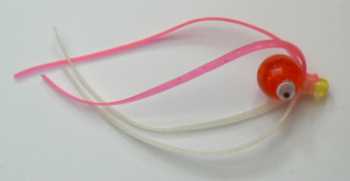 They are 65mm (2.75 ins) long and come in 12 patterns (see catalogue) and can be used behind a L'il shooter flasher or a dodger to fish 5- 35 feet or a spinner to fish the surface. These lures can be used with O'ki Micro flasher for freshwater fishing. 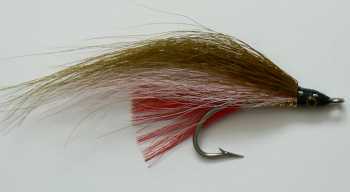 Here in Port Hardy fly fishers use them in the rivers for coho. 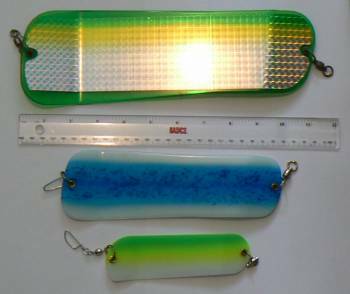 Pictured are three sizes of O'ki Flasher that we suggest for our lures. The Big Shooter is 11.5 ins, the Lil' Shooter is 8.5 ins and the Micro Flasher is 5.5 ins. Please visit our freinds at O'Ki Tackle at www.okitackle.com for their full range of flasher blade and tape colour combinations. Please check out our combination packs where we colour match our lures with our favourite flashers.